The August 23rd, 2016 Bovine Ska and Rocksteady began with two sets of ska, including a set of COWBOY-themed ska which was a silly, last minute decision based on us acquiring the Prince Buster’s 1962 single, Cowboy Comes To Town! We love westerns so what can you do? We ended the two sets of ska with the king of the reggae harmonica, Roy Richards, on Studio One in 1965 with Double Trouble. Our weekly mento show had a few rare gems this week, including The Dictator With The Jamaican Calypsonians and their 1955 tune for the Kalypso label, Chinese Cricket Match. We ended the first hour with a long set of rocksteady starting with the seldom heard band, The Jupiters who cut a Judge Dread styled courtroom tune, The Return Of Ezekial for Joe Gibbs Amalgamated label in 1967. That set ended with another track from 1967, this time a cover of Maurice Williams doo-wop classic, Stay, this time performed by The Summertaires for the Coxsone label. We then went into our spotlight of the Triumph Label. The Triumph label is one of those short lived labels that we are always amazed to dig up! Carlton Bradford was the owner and producer, with releases on Triumph concentrated in rocksteady and early reggae. Bradford was primarily known as a singer; he was a member of The Vibrators and The Soul Cats, both groups that were prolific throughout early Jamaican music. With Leslie Bailey and Solomon Gayle, Bradford recorded as a vocalist as part of The Vibrators, who started with Justin Yap and his Top Deck label. The trio would record through rocksteady and reggae, serving often as backing vocalists for many labels, including Coxsone and Gayfeet. With Ewan McDermott and Kevton Williams, Bradford sang as a member of The Soul Cats, who were active in reggae in the late 70s. The Soul Cats would actually open up the Bradmack label together in America, releasing their own tracks as The Mighty Soul Cats for the label that had its home in New Jersey and was distributed out of the Bronx.For Triumph, we get to hear Bradford focused on rocksteady and early reggae as he got his start as a producer. He attracted quite a lot of talent to Triumph and excellently produced their recordings. 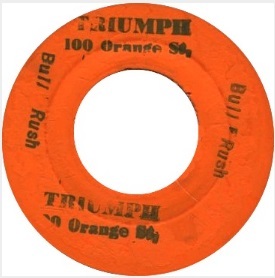 Many of Bradford’s productions were picked up by Blue Cat and Pama’s subsidiary Nu Beat in England, but they originated on Triumph. Winston Wright was one of the most prolific organists in Jamaican music. As a member of Tommy McCook and the Supersonics and Lynn Taitt and the Jets, he recorded extensively with Duke Reid early in his career. He would see enormous success from his essential part in “Liquidator,” the hit from the Harry J All Stars and would go on to record for the backing bands of some of the biggest labels and producers, including Clancy Eccles, Byron Lee, King Jammy, Alvin Ranglin, and Lee Scratch Perry just to name a few. One of the labels that Winston Wright stopped by was Triumph, and he performed with the Triumph All Stars to cut a track for Bradford. We spent the bread that we would’ve used to buy food to get records for the August 9th, 2016 Generoso and Lily’s Bovine Ska and Rocksteady Radio Show, but please don’t let the guilt that you should feel influence you in any way to listen to the this week’s show! Midway through the show, we have a spotlight on Lee “Scratch” Perry’s Wizz-dom label (1972-1973) which is so good that we have almost forgotten how satisfying a square meal feels like when you get to eat one. Amazing cuts from The Heptones, Melodians, Junior Byles and of course, The Upsetters! As the Wizz-dom label is so thick with the reggae, we decided to start off this show the ska, beginning with Joe White’s festive 1965 cut for Duke Reid’s Treasure Isle label, Irene. Our mento set featured the title cut from Percy Dixon’s Scandal In Montego Bay LP which was released on Sue in 1964. After that set, we launched into a long set of rocksteady with a real rarity being The Minstrels 1968 tune for Coxsone on Studio One, Giving Up On Love. We then went right into the Wizz-dom label spotlight. We are thrilled to present a spotlight on a label from one of the most inventive producers, engineers, and all-around performers tonight….Lee Scratch Perry. Over the course of his career, Perry founded many labels. Upsetters, Goodies, and Justice League are just a few, but this week we decided to focus in on the Wizz-dom label. Believed to be born in Kendal as Rainford Hugh Perry, Scratch got his recording first name from his mom’s nickname for him, Leeburn. Perry’s path to music began in Negril. On moving to Negril from Clarendon, where Lee had built up a reputation as a great dancer, Lee worked on construction as a part of Jamaica’s development of the region as a tourist site. During his days spent moving rocks on construction sites, the sounds of the shifting and the clashing of stones spoke to Lee and pointed him toward Kingston to make music. In the Kingston music scene, Lee wore many hats for Coxsone Dodd and Studio One writing and arranging songs and appearing in front of the microphone as a recording artist. After spending a lot of time with Coxsone, Perry moved over to Joe Gibbs before eventually venturing out and creating his iconic Upsetter label, giving him his own avenue to flourish as a producer and arranger. At Wizz-dom, we see Scratch as the mastermind for all goings-on for the music being recorded and the distribution of his recordings. In the early days of Wizz-dom, Pat Francis approached Scratch with “King of Kings,” and after recording it, Scratch felt that Francis would be a good salesman for Wizz-dom and the other labels he had, so Francis became a salesman for Scratch, a position he held for three years. We kicked off the spotlight with this track that started the Pat Francis and Scratch business relationship, King of Kings, a majestic track that set the tone for this Wizz-dom spotlight. The Upsetters, the house band for Lee Scratch Perry productions, had three distinct line ups. By 1972, when the Wizz-dom label was launched, the Upsetters had a fluctuating lineup, but Perry would always insist on using the best musicians he could find for each recording. By 1974, the band membership became more stable with Boris Gardiner on bass, Earl “Chinna” Smith on guitar, Winston Wright & Keith Sterling on keyboards, and Sly Dunbar or Benbow Creary on drums. Saturday, August 6th, 2016, was Jamaican Independence Day! In honor of this momentous occasion, we presented a special Generoso and Lily’s Bovine Ska and Rocksteady Radio Show on August 2nd, 2016 that featured two hours of the best Jamaican rhythm and blues recordings released in the year of Jamaica’s Independence,1962! Joyous songs of freedom from Prince Buster, Owen Gray, Laurel Aitken, Don Drummond and many many more! From 1934-1939, Jamaica would experience the British West Indian labour unrest due to the the severe inequalities between British settlers and native Jamaicans. This protest for equality for native Jamaicans would galvanize the beliefs for Jamaican autonomy, with Alexander Bustamante emerging as the thought leader for the protest and a founder of the Bustamante Industrial Trade Union. Alongside the Union, Norman Manley, Bustamante’s cousin, formed the People’s National Party. Originally, Bustamente approved the party and was a member, but he disagreed with parts of the party’s platform. As a result, he founded the Jamaica Labour Party in 1943. The JLP and PNP would dominate the politics in these years leading up to independence. In 1944, Jamaica got Universal Adult Suffrage whereby each adult had the right to vote irrespective of gender, race or financial status, beginning to raise further thoughts around independence. In 1955, a new constitution was ratified and put in place a two-chamber legislature and organized an Executive Council made up of ten members of the legislature and chaired by the new position of Premier, the head of government. It also set a foundation for a system of checks and balances. On May 30, 1960 Bustamante, pulled himself and the members of the JLP from the West Indies Parliament. Then, on September 19, 1961, Manley, who was the Premier at the time, demanded a referendum vote to see if Jamaica’s residents wanted to participate in the federation or not. Jamaica sought to secede from the federation in 1962, igniting another spark to begin seeking independence from Britain. In February 1962 marked a major success line for the movement for Jamaican autonomy; both Manley and Bustamante traveled to meet with the British Parliament to discuss independence and a new Constitution, and the independence date. Immediately after the meeting, April 10th was set as the voting day to elect the first Prime Minister of Jamaica. Alexander Bustamante won the election in April, becoming Jamaica’s first Prime Minister and then, on July 19th, 1962, the British Parliament passed the Jamaica Independence Act, granting independence on August 6th, 1962. On that independence day, Princess Margaret traveled to Jamaica to represent the Queen in the opening session of Jamaica’s Parliament. Across the island, celebrations began with the exchange of the British flag with Jamaica’s black, gold, and green flag. The inaugural Jamaica Independence festival occurred on independence day with the event initiated by Edward Seaga featuring many music performances, including one from Lynn Taitt’s own band from Trinidad, who had been invited by Byron Lee. Furthermore, Eric Coverly, the man behind the floats of the Jamaica Bandwagon and the husband of Louise Bennett, designed floats and arranged for additional arts celebrations for the momentous day. This weekend prior to the July 26th, 2016 Bovine Ska and Rocksteady, Lily and I had an awesome visit from our old friend Jeff and our new friend Lodrina, we saw a ton of Pialat movies at UCLA and pulled one beast of a Generoso and Lily’s Bovine Ska and Rocksteady Radio Show for you! For our spotlight this week, we put together a special ONE HOUR look at Lloyd Charmers’ SPLASH label which features some of the best Jamaican covers of American soul and pop cuts that we have ever heard. BB Seaton covering The Persuaders, Alton Ellis covering The Spinners, The Now Generation covering Bobby Womack..This label is truly special! The spotlight starts midway through the show. The Fierro household adores Lloyd Charmers. We love him as a member of The Charmers. We love him as a member of The Uniques. And we really love him for his wildly salacious recordings as Lloydie and the Lowbites, so much so that we are always on the lookout at for any Lloydie records wherever we go. Born in Kingston as Lloyd Tyrell, Lloyd Charmers began his career as a singer in the duo known as The Charmers with Roy Willis. The two competed, like so many wonderful Jamaican musicians did, on the Vere Johns Opportunity Hour, and caught the attention of producers in the music scene. The Charmers would record with heavy hitters Prince Buster and Coxsone Dodd, and they would appear in the film This is Ska, but the two would part ways, with Lloyd recording as a soloist and then joining Slim Smith and Jimmy Riley as a member of the second reincarnation of The Uniques. At the close of the sixties and the beginning of 70s, Charmers starting working on his other musical talents. He established a reputation as an excellent keyboardist, and he opened up the Splash label to work on his own productions, bringing in phenomenal talent and his own great love for American soul of the 1970s. We’re thrilled to present you this hour long spotlight on Splash because there are outstanding productions and some covers of soul tracks that challenge the originals. We began with Lloyd himself and the 1969 classic, Birth Control, which was later adapted by The Specials on Two Much Too Young. Charmers house backing band of choice was the Now Generation Band. The seed that started the group was planted when Mikey Chung and Val Douglas were students at the College of Arts and Sciences Technology. The two both went to the same high school together, but they did not begin practicing and recording together until later. They began using the equipment of the disbanded group, Ti & the Titans, and they formed the band the Mighty Mystics. Then the Mighty Mystics broke up and joined an existing band known as Now Generation, creating the house band that people would come to know well throughout reggae. The members of the group were brothers Mikey and Geoffrey Chung on guitar, Val Douglas on bass, Mikey Boo and Martin Sinclair (who was only a member for early recordings) on drums, Robbie Lyn and Wire Lindo on keyboards. The July 19th, 2016 Bovine Ska and Rocksteady may go down as one of the silliest shows that we have done in the twenty year history of the radio show. It seems that the heroes of comic strips and comic books were firmly in the minds of some of Jamaican greatest recording artists as we have comic book inspired tunes about Batman, Superman, Popeye, Spider-Man, Jungle Jim being performed by everyone from Hopeton Lewis to The Upsetters to Big Youth! Here’s a bit of background on comic books and their relation to Jamaican music to help you prepare for this show! Silver Age of Comics – approximately from the mid 1950s to the early 1970s. These superheroes of the Golden and Silver Ages would make their way all over the world, and Jamaica was not an exception. In Jamaica, comic books would be sold alongside general goods sold at Chiney shops. In addition to the superheroes, comic strips and comics from other genres would also gain popularity, especially the Western comics such as Kid Colt, Lone Ranger, and Roy Roger whose title characters would become the performing names for many artists in reggae. Jungle Jim debuted on January 7, 1934. Created by Alex Raymond, Jungle Jim was focused on the story of the hunter Jim Bradley. Raymond also created Flash Gordon, one of Generoso’s favorites, and Jungle Jim was intended to compete with the successful Tarzan stip and to sit above Flash Gordon. As a result, both Jungle Jim and Flash Gordon reached the public eye for the first time on the same day. Andy Capp is a British comic strip that first appeared in the Daily Mirror in 1957. Andy is a working class man from Hartlepool, and for decades, readers have seen Andy at his home, local pub, and about town. Though a bit gruffer than gruff, Andy has had a strong following through the years, and the strip is still going strong to this day. Of all of the comicbook characters we found for this show, there was none more popular than Jughead. Interestingly, Jughead Jones made his debut in 1941 in Pep Comics, and he has continued to exist in the Archie universe since. Known for being a little bit of an outsider, Jughead has a signature humor and an S on his shirt, which is believed to be from an abbreviation of Skunk Hill in Haverhill, MA. Here on the Bovine Ska, we look for any excuse to play tracks from Count Ossie and Cedric ‘Im’ Brooks, and that was what led us to this week’s label spotlight on the New Dimension label. Brooks’s career got its humble start at the Alpha Boys School, and upon graduation, he toured with the Jamaica Military Band. Originally a clarinet player, he switched to saxophone when he played with the Vagabonds and would stay with sax in the years to come as a member of Sonny Bradshaw’s stage band and the Granville Williams Orchestra. Brooks’ style evolved when he moved to Philadelphia in the late 60s, and as a student at the Combs College of Music, he got further exposure to the experimental jazz work of Sun Ra and Pharoah Sanders, and they would heavily influence his arrangements and his playing style when he returned to Jamaica. On his return, Brooks first created the Mystics to perform the works combining the jazz he learned in Philadelphia with reggae, which was surging on the island. The Mystics met Count Ossie and his percussion group, forming Count Ossie & The Mystic Revelation of Rastafari. Arthur Wedderburn, a jazz collector, opened up the New Dimension studio and label to record the seminal Count Ossie & The Mystic Revelation of Rastafari record Grounation Wedderburn produced and engineered with that record, and it is one of the few productions he did for the label. Many of the recordings on New Dimension had other producers, giving us the sense that outside of the Count Ossie record, New Dimension was a studio and label that artists and producers could bring their songs to for recording and pressing. And, of course, we began with the Count Ossie and Cedric Im Brooks collaboration that is The Mystic Revelation of Rastafari with their track, Lumba.